The gospel passage this morning, "The Feeding the Five Thousand" is the material of Sunday School lessons that many of us heard when we were children. It was a nice story, with pretty pictures of Jesus, his disciples, and the crowds on a flannel graph. But the writers of the gospels gave this simple story incredible importance. Aside from the resurrection, it is the only miracle that appears in all four Gospels. And if that was not enough, Matthew and Mark repeat the miracle as the feeding of the four thousand. Just in case you did not get the point the first time. In the text immediately prior to today's reading in Matthew, Jesus learns that Herod has had John the Baptist beheaded at the request of Herod's daughter. That whole story is sick. Evil had triumphed and when Jesus hears this news he went off by himself in a boat to, what the bible refers to as, a deserted place. We don't know why Jesus went to this deserted place by himself, perhaps to grieve, perhaps to pray, perhaps he himself was fearful of Herod, or perhaps to meditate on his own impending death. For whatever reason, Jesus wanted to be alone. What do we do when it appears that evil has triumphed? Biblical Galilee was densely populated. Consequently, it was difficult to go somewhere unobserved. People saw Jesus get in the boat. They saw which direction He when. And a crowd of 5,000 men and uncounted women and children followed. Again, we do not know why they followed Jesus. Perhaps the crowds were expecting a declaration of revolution. Perhaps they just wanted a dinner and a show. 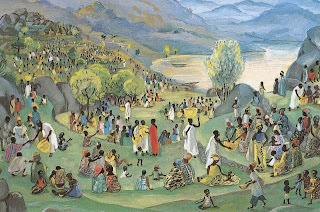 But whatever the reason, these poor peasants from Galilee followed Jesus with all their needs and all their suffering. When Jesus saw the crowd, the scripture says he had compassion for them. That would not be my reaction to being found by a crowd of thousands when I wanted to be alone, but it was His. Jesus saw the crowd. He saw the sick. He saw the need. And out of what he had he gave of himself and healed the sick. He met the need. Towards evening, the disciples came to Jesus and said, "It's late. The people are hungry. Tell them to go someplace else and get some food." The disciples had been with Jesus and had learned to see the needs of people. They saw that the people were hungry and they proposed a solution. "God, you fix it! You tell them what to do." Then Jesus told the disciples, "You give them something to eat." The disciples had exactly 5 loaves and 2 fish. All they had for their own supper. They knew that they could not feed thousands of people. They were overwhelmed by what they saw and the seeming insufficient resources at their disposal. Jesus was asking them to give away their own meager supplies. He asked them to risk it all, to take a chance on extravagant generosity. Jesus took what the disciples had, their 5 loaves and 2 fish and he prayed. He blessed and broke the loaves. He gave them away. And everyone ate and was filled. There were even 12 baskets of food left over, one for each disciple. God's abundance was more than enough to meet everyone's needs. The kingdom of God had come upon all of them that day. The mustard seed had somehow grown into a giant tree. On that day when Jesus wanted to be alone, he saw a need and gave of himself to heal the sick and meet the need. Later the disciples saw a need and, with the help of Jesus, they more than met the needs of the hungry people in that deserted place. This story reminds me of the ELCA tagline, "God's work, our hands." In addition, Jesus taught the disciples, that whatever they had would be more than enough in collaboration with Christ. The disciples were learning to cast their lots with Jesus, to risk what they had in His service. The disciples were being invited to invest their all. More than a decade ago, I, like Jacob in this morning's scripture, was struggling with God. As a result of my struggles, I did what I had actually wanted to do for many years. I traveled to Haiti. I wanted to see that country for myself. I wanted to learn about the people. I wanted to see their needs. As a geologist, who specializes in ground-water resources, I wanted to know what the Haitians needed and what I could do. The needs in Haiti are great. Many of the needs are quite obvious. Almost everyone in Haiti lacks an adequate supply of clean freshwater. Throughout Haiti you can see women walking with 5 gallon buckets on their heads. Many of the women are filling their buckets from streams that are obviously contaminated with human waste. On my first trip to Haiti, I helped drill a water well near the town of St. Michal, a town of about 60,000 people. After we completed that well, the people pumped that old-fashioned hand pump at a rate that filled one five-gallon bucket every 60 seconds. Today, I have been told that they still pump that well at that rate every single day from before the first light of dawn until after dark. They do that, because that one well is the only source of clean freshwater for the 60,000 people that live in St. Michal. On my second trip to Haiti, we went to the town of Bassin Bleu in the northwestern peninsula and trained a group of Haitians to drill water wells. When we completed the well in Bassin Bleu the parish priest was so excited he actually danced in the mud puddles around the well while wearing his vestments. After we left, that crew of Haitians continued to drill water wells at a rate of about one per week. After 17 short-term mission trips to Haiti, I had to ask myself, "Who am I fooling?" And I applied to the ELCA-Global Mission and they sent me to be a Water-Resources Specialist for the Evangelical Lutheran Church in the Central African Republic. It is dangerous to listen to the Gospel. Perhaps the ushers should be passing out crash helmets instead of bulletins. My wife and I struggle as we work in the Central African Republic. There are so many needs, it can be overwhelming. Our resources are meager. At times, it appears that evil, sickness, and death have won. But with God's help and your prayers and support, we continue God's work in a deserted place. Some days are a tremendous struggle. But on some days, needs are met, the hungry are feed, and the thirsty have clean water. Praise God! I saw a need in the Central African Republic. With God's help and with your support, we are giving clean freshwater to thirsty people. I want to thank you for your help in that effort. But more than that, I encourage you to look around for needs that need to be met, wrestle with God, and give of yourself to meet those needs. By giving ourselves, we become the true presence of Christ to others. Look at your own resources, as insignificant as they may seem, and risk placing them in Jesus' hands for Him to bless. Together with Jesus, you just may accomplish a miracle. Amen. Sermon based on Genesis 32:22-31 and Matthew 14:13-21, given on Sunday, August 21, 2011 at the First Lutheran Church in Williston, North Dakota by Dr. Joseph W. Troester, while he was on home assignment in the States. 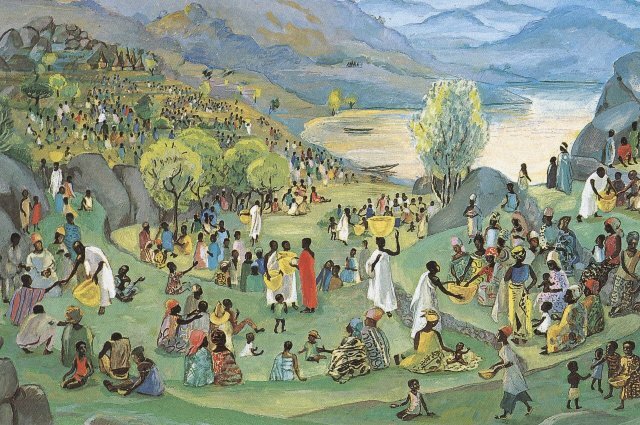 Painting: "Feeding of the Five Thousand" by Mafa in Cameroon. Photo of painting from Vanderbilt University Library.